Cliff Terminal Postsare extensively used on wood, plastic and metal cabinets for instruments, amplifiers, loudspeakers etc. The terminal posts will accommodate a 4mm banana plug in the front hole, and/or a 2mm wire or plug in the cross hole. 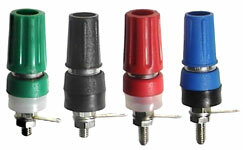 Rear stud portion is threaded 4BA.They are produced in 8 colours, from Low Loss Polypropylene. Metal parts are nickel plated brass, or gold plated to order. Note that TP3 and TP4 terminal posts have rear stud 4mm longer than TP1/2. Terminal posts comprise of: threaded stud assembly, 2 panel insulators with location keyway, one solder tag, 2 washers and nuts. These are usually supplied unassembled. For distributors we will supply assembled terminal posts, by agreement. Supplied in 8 colours - Rated 15A. Part No depends on colour. TPP2 - A dual assembly terminal post designed to meet USA norms. Cross hole is 2mm. TPP1 - Our terminal posts TP1-4 may be mounted into TPP1 to give dual assemblies with features to suit particular applications. Rated 15 Amps.